Red Baron is a fine game from Aristocrat Gaming with a 1950 aero adventure theme . When playing this Australian pokie machine you will come across a navigation (WILD), target (SCATTER), Red Baron, Baroness, Radio, Aeroplane, Dog and Blimp symbols. This war inspired game also includes the K, Q, J, 10, 9 symbols. This is a REEL POWER play game with 243 ways to win per spin. 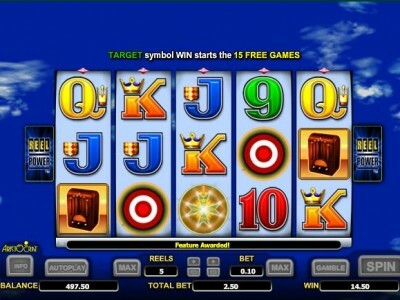 To hit the 15 free spins you need 3, 4 or 5 of the target scatter symbols. This provides the mission bonus whereby you can win the following if the number of planes below appear..
Red Baron also features the classical Aristocrat gamble feature so players can easily expand their winnings.